With the advent of Li-Fi technology, human brain has given rise to a new phenomenon in the form of Li-Fi or Light Fidelity. Li-Fi, a wireless communication technology, which is expected to enhance the overall experience of the user by its user-friendly interface. With the constantly evolving technologies such as, 5G wireless broadband, and Internet of Things (IoT), among others, Li-Fi technology is bound to expand to many more fields of applications such as healthcare, aviation, retail and education, among others and transform all the major industry verticals present in the world today. The demand for Li-Fi technology varies according to various geographical regions. The Li-Fi technology market holds a prominent share in various countries of North America, Asia-Pacific (APAC), Europe, and Rest-of-the-World (RoW). Geographically, Europe led the global Li-Fi technology market in 2017 in terms of value. 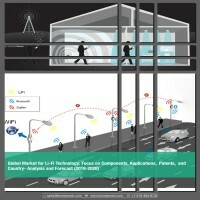 Additionally, APAC region is expected to witness the highest growth during the forecast period (2018-2028) Increase in usage of wireless data in smartphones and other devices such as laptops, and tablets, among others due to growing population and rapid urbanization in the region is expected to drive the market for Li-Fi during the forecast period. In addition, increase in demand for high speed, bidirectional, and fully secured wireless communication is estimated to boost the market for Li-Fi in the region. The global Li-Fi market has witnessed several strategic and technological developments in the past few years, undertaken by the different market players to attain their respective market shares in this emerging domain. Some of the strategies covered in this section are product launches, partnerships and collaborations, and mergers and acquisitions. The preferred strategy for the companies has been partnerships and collaborations in order to strengthen their position in the global Li-Fi market. 7.13 Samsung Electronics Co., Ltd.
With the advent of Li-Fi technology, human brain has given rise to a new phenomenon in the form of Li-Fi or Light Fidelity. Li-Fi, a wireless communication technology, which is expected to enhance the overall experience of the user by its user-friendly interface. With the constantly evolving technologies such as, 5G wireless broadband and Internet of Things (IoT), among others, Li-Fi technology is bound to expand to many more fields of applications such as healthcare, aviation, retail and education, among others, and transform all the major industry verticals present in the world today. The global Li-Fi technology market is expected to grow at a CAGR of 71.2% in terms of value during the forecast period 2018-2028. This growth can be attributed to the increasing demand for advanced data transmission technology. Furthermore, the rising demand for higher bandwidth, advantages associated with Li-Fi technology and tremendous development in the Research & Development (R&D) for Li-Fi technology to overcome the technical challenges are expected to drive the global market for Li-Fi during the forecast period (2018-2028). The factors driving the growth of the global Li-Fi market include adoption of light emitting diode (LED), superior properties of Li-Fi, and increased demand for wireless networks. One of the major driving factors for the significant growth in the global Li-Fi market has been the adoption of the Light Emitting Diode (LED) based lighting systems. This has improved the energy efficiency and is catering to the prevailing issue of the global energy crisis. Owing to these rapid technological developments and scientific innovations, companies have started to adopt solid-state lighting aggressively for minimization of the per unit costs, and at the same time, increasing their energy efficiency. However, even with such enormous growth of demand, the global market for Li-Fi is facing immense challenges which include technical challenges, and lack of awareness regarding Li-Fi. One of the major factors acting as a restraint in the development of the Li-Fi technology is the fact that the Li-Fi signals can’t penetrate through walls. The Li-Fi technology uses visible light communication for the signal transmission. Since light cannot penetrate through walls, the communication is interrupted. Internet can only be used where there is light source available. The light can’t penetrate through the walls as it works only in the line of sight path. Thus, it is necessary to make sure that there is no obstacle present in between the LED lamps and the receivers and that the data is normally received by the receiver. This is because the presence of an obstacle between the lamp and the receiver can lead to a data loss. Li-Fi is one of the emerging technologies that effectively turn LEDs to data transmitters. The Li-Fi enabled LEDs help create high speed, optical wireless communication that leverages the visible and infrared light spectrums. This is achieved through the modulation of light at various frequencies that are imperceptible to the human eye in most lighting applications. Semiconductors, majorly LEDs can turn on and off up to a million times per second, enabling the diodes to send data quickly. Li-Fi technology is widely used in various applications such as healthcare, education, retail, aviation, exhibition industry, and others. Healthcare is one of primary application areas in the global Li-Fi market. Hospitals have always received technology in the form of wired connections. Though, the operations and other hospital activities were carried out without any hindrance, the commercialization of Li-Fi in the healthcare sector would lead to high speed data network in the hospitals. Li-Fi or Light Fidelity is one such solution which does not interfere with the radio waves. Geographically, Europe led the global Li-Fi market in 2017 in terms of value. The growth in the region was mainly attributed to its increase in its adoption in various industries such as healthcare, defense, security and consumer goods, among others. Rise in demand for energy-friendly high-speed wireless network solutions is driving the market in the region. Asia-Pacific is estimated to witness the highest growth rate during the forecast period. Increase in usage of wireless data in smartphones and other devices such as laptops, and tablets, among others due to growing population and rapid urbanization in the region is expected to drive the market for Li-Fi during the forecast period. In addition, increase in demand for high speed, bidirectional, and fully secured wireless communication is estimated to boost the market for Li-Fi in the region.